This article has been published with the permission of its author Yukari Pratt. Yukari writes for Tokyo`s Metropolis magazine and for the The Japan Times. She has contributed to the guidebook, Time Out Tokyo and to Time magazine. Yukari has been profiled in GQ Japan and The Daily Yomiuri. A Japanese food fanatic, whose mother is Japanese, she is on a mission to bring the food of Japan to as many people as possible. Her hobbies include soaking in "onsen" hot springs, drinking shochu, fly-fishing, and motorcycling. Growing up I could never understand why my friends did not like spinach. It was a staple in my house. Almost always was there a stash of ohitashi in the refrigerator. At anytime one could help oneself to the dark leafy greens that had been quickly blanched and were marinating in a soy sauce and sesame dressing. Funny how one assumes as a child that everyone grows up eating the same dishes, only to realize that is not the case. I remember being somewhat disappointed (OK, disgusted) going to a friends house and being served overly-steamed spinach with nothing more than salt. The US Agriculture Department has just come out with its new dietary guidelines. It encourages eating four to five servings of fruits and vegetables each day. Japan offers a rich diversity of vegetables; if you can break from old habits and consider having your vegetables in a wafu style, abiding by the new guidelines may not be as hard to swallow. Making the transition to cooking Japanese food does not have to be difficult. Working a full-time job leaves little time for cooking leisurely at home. The simplicity of Japanese food is just that: simple. Consider sashimi: nothing more than wasabi joyu (wasabi and soy sauce) and raw fish. The following are easy to create, healthy and best of all, delicious. If you are really in a bind, I would pick up some of these that are pre-mixed and keep them on hand. I try and keep a few jars of pre-mixed dressings in the refrigerator at all times. 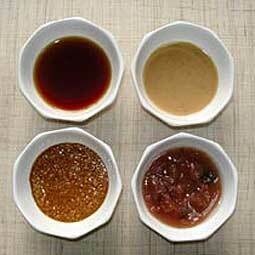 Ponzu sauce is one parts yuzu juice, soy sauce and dashi. This refreshing sauce is great as a dipping sauce for shabu shabu or simmered tofu. It also makes for a nice salad dressing. Yudofu nabe is a healthy, vegetarian nabe, originating from Kyoto. In your nabe, assemble kombu (which will provide the dashi), bite size pieces of tofu, and vegetables as you like such as napa cabbage, shungiku (chrysanthemum leaves), green onions and carrots. Use the ponzu sauce as a dip for the tofu and vegetables. Caution: Goma miso, one part Saikyo miso (the sweet, white miso from Kyoto) and one part nerigoma (creamy sesame paste), may be the most addictive sauce. At this point, it is still quite thick, so feel free to loosen it up with some dashi. You may also adjust the flavor by adding sugar or soy sauce. This tasty treat is also used as a dipping sauce for shabu shabu. I like this with leafy dark greens which have been blanched. Umeboshi dressing is one part ume (the meaty part from umeboshi, which you can purchase in a tube), one part dashi and a half-part sesame oil. This puckery dressing is lovely over julienned daikon, and is quite addictive. Another simple favorite is roasted sesame seeds ground in a suribachi (mortar and pestle) and seasoned to taste with sugar, soy sauce and some dashi. This dressed with blanched green beans or broccoli makes eating vegetables fun. You can use either white or black sesame seeds. To roast at home, place the sesame seeds in a small, dry pan and gently roast over low heat. The thin skinned sesame seeds will burn quickly, so keep the pan moving. If you have extra sesame seeds leftover, sprinkle over rice as furikake. For you mustard fans, try mixing up some karashi mustard with some soy sauce, dashi, and a bit of sugar to soften up the heat. The heat of the karashi mustard warms up this dressing. Who knew that eating vegetables could be this much fun? These healthy dressings are not only easy to assemble, but they are also a great way to boost the flavor of something that can be bland, like spinach. Even if the only sauce Popeye needed was Olive Oil, the rest of us need more.